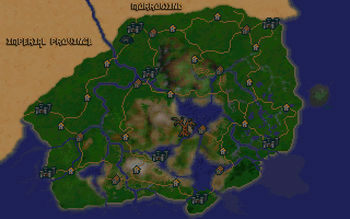 Black Marsh is one of the nine provinces you can visit in Arena and the starting location for Argonian characters. It is a swampy region, situated in the southeast corner of Tamriel. It borders Morrowind to the north and the Imperial Province to the northwest. During the Main Quest, you will travel to the Vaults of Gemin, as well as locate the seventh piece of the Staff of Chaos in Murkwood. Archon — A city-state in southeastern Black Marsh, south of Thorn and east of Blackrose. Blackrose — A city-state in central Black Marsh, south of Helstrom and west of Archon. Gideon — A city-state in western Black Marsh, north of Soulrest and near the border of the Imperial Province. Helstrom — A city-state located in the heart of Black Marsh. Lilmoth — A city-state located on the southern coast of Black Marsh. Soulrest — A city-state in southwestern Black Marsh. Stormhold — A city-state located in northwestern Black Marsh, near the border of Morrowind. Thorn — A city-state located on the northeastern coast of Black Marsh, near the border of Morrowind. Greenglade — A town located in north-central Black Marsh, directly east of Helstrom. Greenspring — A town located in central Black Marsh, southwest of Helstrom. Moonmarch — A town located in southwestern Black Marsh, southwest of Blackrose. Riverwalk — A town located in northeastern Black Marsh, west-southwest of Thorn. Rockgrove — A town located in western Black Marsh, southeast of Gideon. 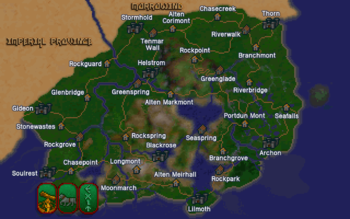 Rockpark — A town located in southeastern Black Marsh, north-northeast of Lilmoth. Seaspring — A town located in central Black Marsh, northeast of Blackrose. Tenmar Wall — A town located in northwestern Black Marsh, just east of Stormhold. Alten Corimont — A village located in northwestern Black Marsh, east of Stormhold. Alten Markmont — A village located in the heat of Black Marsh, southeast of Helstrom. Alten Meirhall — A village located in southern Black Marsh, northwest of Lilmoth. Branchgrove — A village located in southeastern Black Marsh, west of Archon. Branchmont — A village located in northeastern Black Marsh, southwest of Thorn. Chasecreek — A village located in northern Black Marsh, west of Thorn. Chasepoint — A village located in southwestern Black Marsh, east of Soulrest. Glenbridge — A village located in western Black Marsh, east of Gideon. Longmont — A village located in southern Black Marsh, southwest of Blackrose. Portdun Mont — A village located in eastern Black Marsh, northwest of Archon. Riverbridge — A village located in eastern Black Marsh, between and slightly west of Thorn and Archon. Rockguard — A village located in western Black Marsh, west of Helstrom and south-southwest of Stormhold. Rockpoint — A village located in northern Black Marsh, northeast of Helstrom. Rockspring — A village located in south-central Black Marsh, northwest of Blackrose. Seafalls — A village on the eastern coast of Black Marsh, northeast of Archon. Stonewastes — A village in southwestern Black Marsh, north of Soulrest and southeast of Gideon. This page was last modified on 10 February 2019, at 23:53.